NORTH Beach centenarian Lily Foot says keeping busy is the secret to a long life. Mrs Foot celebrated her 100th birthday on February 13 with friends and members of Evergreens Garden Club. She has been part of the club for 25 years and a keen gardener throughout her life, until having to give it up a few years ago. Friend Stephanie Winnett said Mrs Foot still lived independently in North Beach, where she has lived since 1957, and keeps busy by knitting, bottling and baking. “Her secret for a long life is to keep busy,” she said. “Her son, Roger, agreed and said that his parents were a wonderful team who had common sense and worked in harmony to achieve their goals. 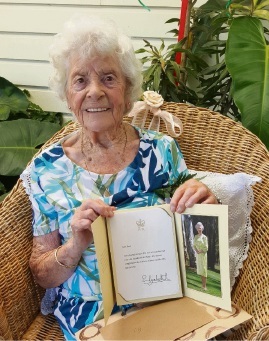 Born in England, Mrs Foot was delighted to receive a 100th birthday card from Queen Elizabeth II.